Hairz Online: European Silky Weaving 20"
Hairz Online - Human Extension - Silky Straight 20"
European Straight Weaving Hair 20". Premium Quality. European Straight Weaving Hair 20". Light Colors. * Light colors are easily damaged during double processing. 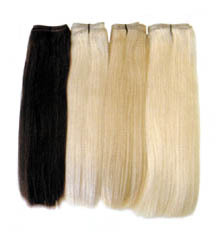 We carry higher grade on light colors to offer consistently good grade and color meeting Hairz's strict quality standards.